Publisher: Geoffrey Nevine December 19, 2018 This information is provided solely as a guideline. If you love lemon, you absolutely need to make this.. like now. I can assure you that this will be your new favorite! Preheat oven to 350° Grease a bundt pan very well making sure to really get into all crevices then lightly flour pan. Set aside. Lightly whisk flour, baking powder and salt in a small bowl and set aside. In the bowl of your stand mixer (if you're using one) fitted with the paddle attachment, beat eggs on low until they are thickened and very pale yellow in color. Turn mixer on low and slowly add sugar to a running mixer and beat on medium-high speed until light and fluffy. Stir in vanilla, lemon juice, and lemon zest. Slowly pour in dry ingredients on low speed until combined. In a small saucepan, heat milk until very hot and butter is just melted. Do not boil and whisk the mixture to help the butter along. Pour into batter and mix until smooth. The batter will be very thin. Pour into prepared baking pan and bake for 27-35 minutes or until a toothpick inserted into the center comes out with a few moist crumbs. Once done, remove cake from oven and allow to cool for 5 minutes in pan. Release the sides of the cake with a butter knife to ensure it isn’t going to stick. Turn cake onto a large round platter or cake stand. (If using a 9x13 pan, do not remove cake, just place entire pan onto a wire rack so underneath the pan can cool also.) Allow cake to finish cooling until warm to the touch. For the glaze, whisk powdered sugar and lemon juice, using more or less lemon juice as needed to get the desired consistency. (I like to keep mine slightly thick so it won’t thin out too much when I serve it over warm cake.) 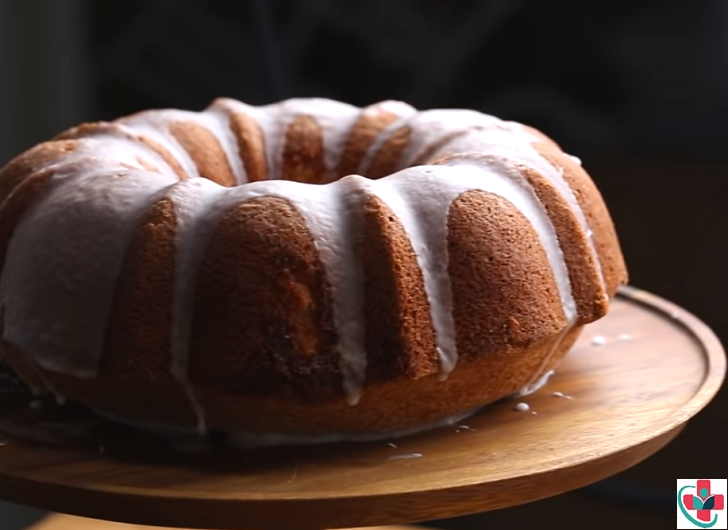 Once the cake is cooled down slightly, drizzle glaze over warm cake. Alternately, you can drizzle the glaze over each individual piece being served. Sprinkle lemon sugar on top. The cake will stay soft and moist for 3 days stored in an airtight container.